See also the Clay Baskets page for more carrying boxes. A roomy rear mounted aluminum cargo box. A heavy duty cargo utility box designed to carry up to 150 lbs. The lowest price for an all aluminum rust free cargo box! --Made out of 14 gauge rust proof aluminum. --Comes in diamond plate aluminum or powder coated black finish. --The dimensions are 42" x 30 x 8 1/4". --The maximum carrying capacity is suggested at 150 lbs. --The cargo box weights 45 lbs. The Club Car Precedent cargo box weighs 50 lbs due to extra hardware. --The Club Car Precedent utility box kit includes new top supports. For other models, contact Customer Service if you need new aluminum ($39) or black ($43) top supports. 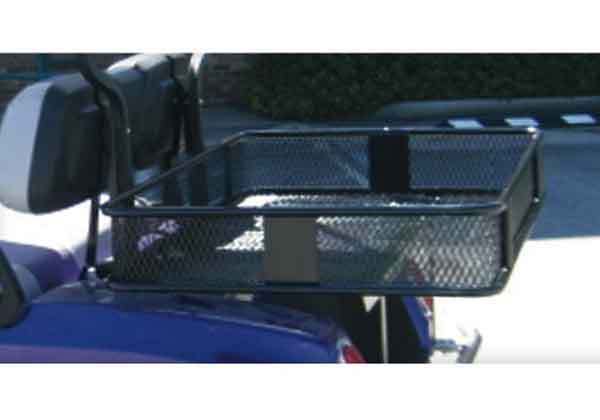 --The tail gate can be in the up or down position. The latch is made of rubber to eliminate creaking sounds when on rough terrain. --Heavy duty springs are suggested due to the added weight on the cart. Please follow this link to the Springs and Coils page. --A shipping surcharge is added due to the heavy and bulky nature of the cargo box. The most versatile and affordable cargo box in the industry. This portable golf cart utility cargo box is a durable, lightweight, and inexpensive box that installs in seconds to the roof or fold down rear seat of any golf cart. Take it out on the sand or to the picnic ground. 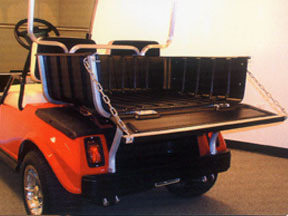 --Fits on all golf carts fold down rear seats and tops including Club, E-Z-GO, Fairplay, Tomberlin and Yamaha golf carts. --The dimensions are 40" x 30" x 9". --Made of light weight, but durable, hard ABS vacuum-molded plastic that will hold up in the sun for years. --Comes with four custom velcro straps to hold the cargo box in place. --Has handles on the sides for easy pick up. Customers interested in our cargo and utility boxes can also see the full selection of Clays Baskets by following this link. Heavy duty springs are available for Club Car and E-Z-GO golf carts. A mesh cargo utility box that prevents water build up and allows air to flow through the box. --Made out of black powder-coated expanded metal. --Dimensions are 30" length x 43" width x 6 1/2" height. --Easy to install, and installation instructions are included. --Heavy duty springs are recommended if you intend to carry a weighty load. 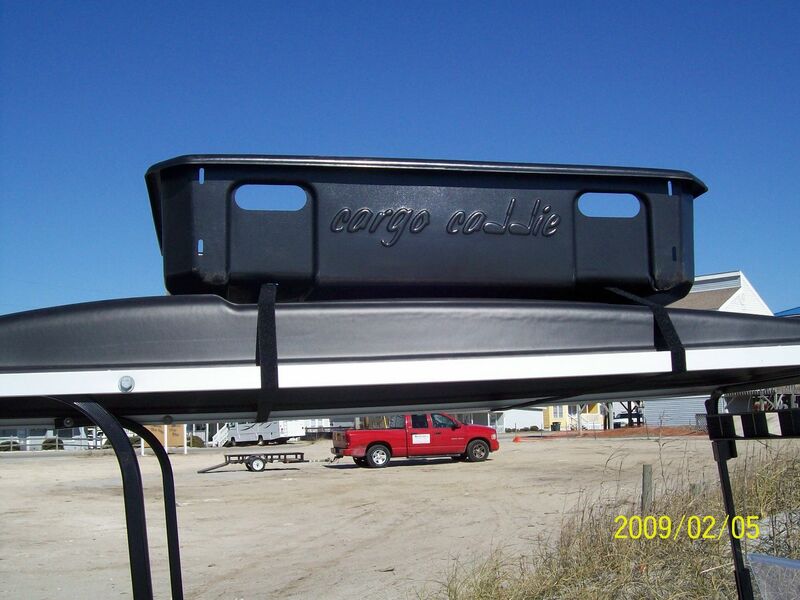 --The Club Car Precedent cargo box includes new top supports and extra hardware. For other models, contact Customer Service if you need new aluminum finish or black top supports. --A shipping surcharge is added due to the heavy and bulky nature of this product. Equip your golf cart to carry everything with this strong utility cargo box. 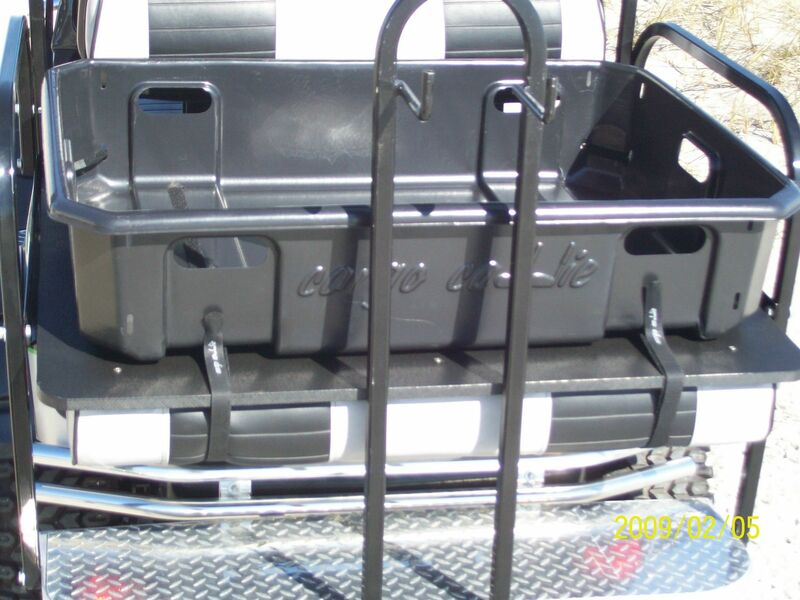 Golf cart cargo uility box that is light weight, durable high-density polyethylene construction. 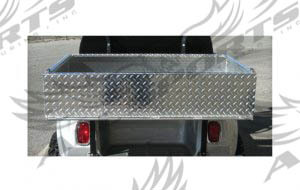 -Hinged tailgate with chains for greater versatility. -37" wide x 27" long x 10" deep cargo area. -Includes all hardware (nuts & bolts) for mounting. -If you have a top on the golf cart, new rear supports are required for Club, most Yamaha's, and E-Z-GO golf carts with the exception of the E-Z-GO RXV. The RXV factory top supports may be used with our RXV utility box. Other exceptions where the existing factory-made top rear supports can be used are the Yamaha G22 and Yamaha Drive models. Also, the Yamaha G2/G9 models do not need new top supports if the existing supports are side mounted rather than mounted to the bag rack. Choose aluminum or black rear supports. The supports are made out of aluminum. -One year warranty for materials and workmanship. Heavy duty dumping cargo utility box for large loads to 500 lbs. -Lightweight, durable high-density polyethylene construction. -Includes all hardware for mounting. -Can carry up to 500 lbs. -Manual release handle allows you to raise the box and dump cargo. -New rear supports are required for Club, most Yamaha's, Fairplay, Star, and E-Z-GO golf carts with the exception of the E-Z-GO RXV. The RXV factory top supports may be used with our RXV cargo box. Other exceptions where the existing factory-made rear supports can be used are the Yamaha G22 and Yamaha Drive models. Also the Yamaha G2/G9 models do not need new supports if the existing supports are side mounted rather than mounted to the bag rack. Choose aluminum or black rear supports. The supports are made out of aluminum. Look at this big load!! "The dumping box has been great. I use it to carry hay, feed, etc all over the horse farm. Very handy." Sabrina B., New Market, AL., February 2016. Add heavy duty springs to your golf cart when you want to carry extra weight. Heavy duty springs are used for golf carts with lift kits, rear seat kits, and cargo and utility boxes. Heavy duty springs enhance the stability, performance, and ride quality of the golf cart. --Increase your cart's off road capabilities. 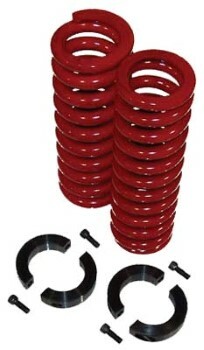 --Set of 2 rear heavy duty springs. 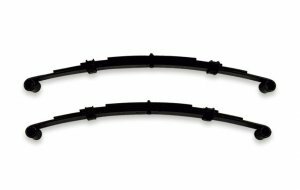 --These are 4 leaf springs which adds height and a greater spring. --Come complete with mounting hardware. --Bushings are included for the Club Car DS and E-Z-GO Med/TXT golf carts. The springs can be used on lifted or non-lifted carts. --For the Club Car Precedent, you would use the existing bushings and sleeves on lifted carts. The non-lifted Club Car Precedent springs come with U bolts. 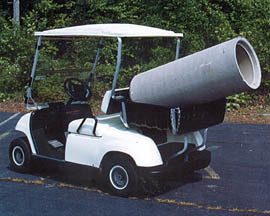 --Work on gas or electric golf carts. --These heavy duty springs are not available for Yamaha golf carts. Add coils to your older Yamaha G2/G9 & G8 for a better, more stable ride. A combination of heavy duty coil springs on new rear shocks made for the Yamaha G2/G9 and G8. --Fits the G2/G9 and G8 only. For later model Yamaha's, see the replacement coils below. --Recommended for our aluminum and steel rear seat kits and cargo boxes. --A combination of heavy duty coils on new shocks. --Important for carts with heavy back loads including rear sears, lift kits, and cargo utility boxes. --Results in better steering control and stiffens the rear of the cart for greater support. "The shocks were exactly as we had hoped. 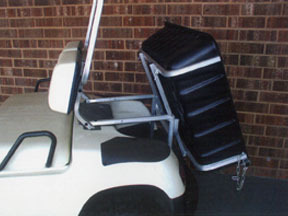 They were easy to install, and the golf cart with rear seat is now stable and a joy to ride. Thank you for the follow-up. The shocks are a great product." Terry R., Forney, TX., July, 2016. Add coils to your newer G14-Drive Yamaha for a balanced smooth ride. Heavy duty replacement coils over existing springs for the Yamaha G14-Drive 2. --Comes as a set of 2 springs and 2 mounting collars. --Fit the Yamaha G14/G16/G19, G22 and the Drive (G29). --Provides extra rear support for heavy rear seats, lift kits, and cargo utility boxes. --Stiffens the cart to prevent "rear squatting." 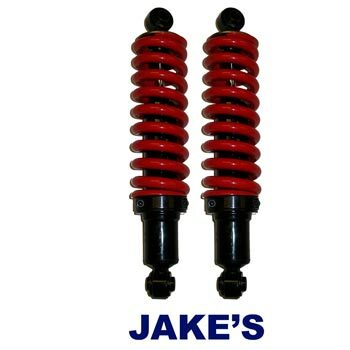 --Simply remove your existing coil over springs and replace them with the heavy duty springs. --Works on lifted and non lifted carts. --Results in better steering control when the cart is loaded with cargo or people. Customers who bought the cargo box also were interested in the under seat storage tray and windshields. Let our friendly customer service staff answer your questions about any of our golf cart cargo and utility boxes. 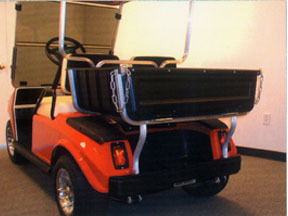 Choose from golf cart aluminum cargo box, golf cart polyethylene utility box, or golf cart ABS plastic cargo box. Please click on any of the golf cart accessories to the left to get full technical descriptions, prices, and ordering information. 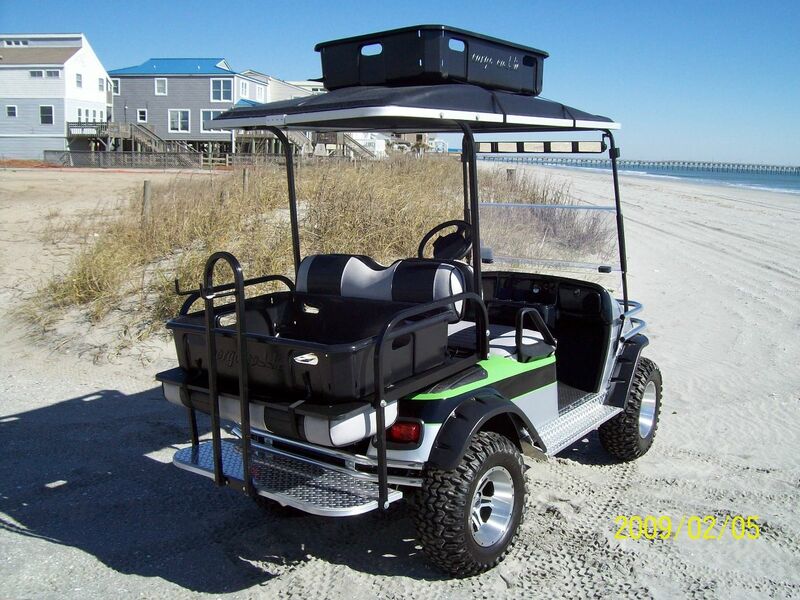 Make your golf cart look the best in town with golf cart accessories from Frugal Dougal’s Golf Cart Accessories!